I have a terrible confession. I’ve seen the films but I haven’t read the books. That said, as I squeezed myself into a corset at the Fashion museum in Bath, I was able to relate to Jane Austen. No wonder she wrote such scathing criticisms of society- she couldn’t breathe most of the time. Had I met Mr Darcy at that moment, he would have been wasted on me entirely and our eternal love would never have flourished- I needed air, not a man. Once I was uncorseted, my priorities changed and I strode out of the museum in search of the modern day Darcy. 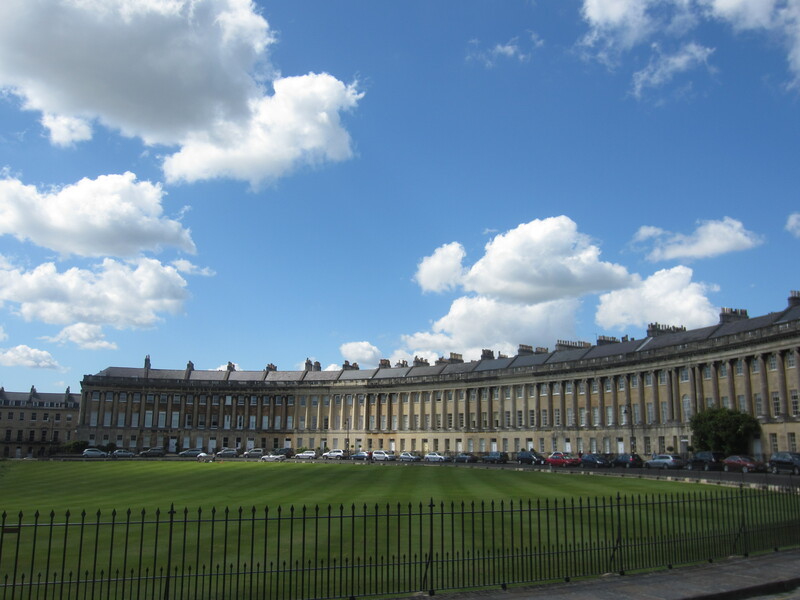 The Royal Crescent seemed an obvious place to start. Voted as the second most picturesque street in Britain, the Georgian architecture and the grassy lawns in front of the curve seemed an ideal place to meet him. At least I hoped so, not having read Pride & Prejudice, I wasn’t exactly sure if that was where he should be. While the architecture was impressive, the Mr Darcy lookalikes were not in abundance. 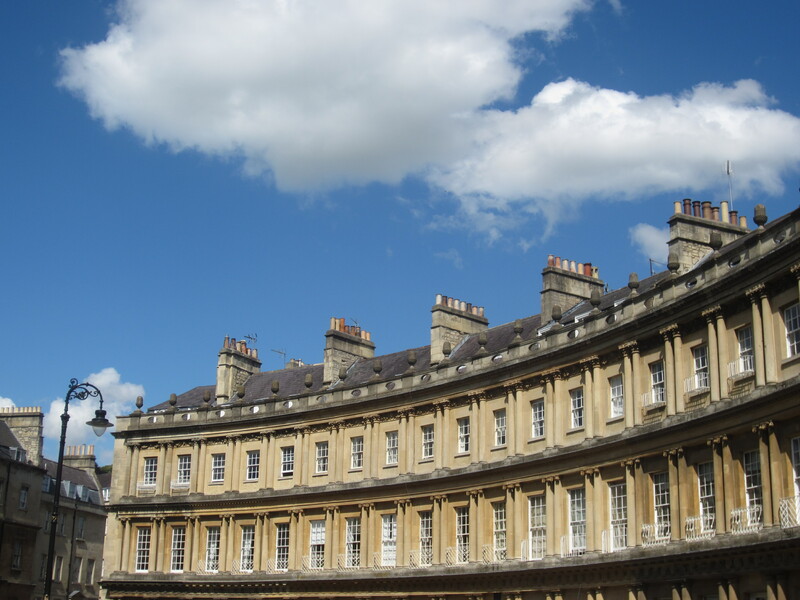 The Crescent was filled with families picnicking, couples canoodling and seagulls squawking. The next stop was the Roman Baths. In Austen’s time, so the film Northanger Abbey tells me, the wealthy frequented these thermal spas for their medicinal properties. With my health in order, I search for Darcy. 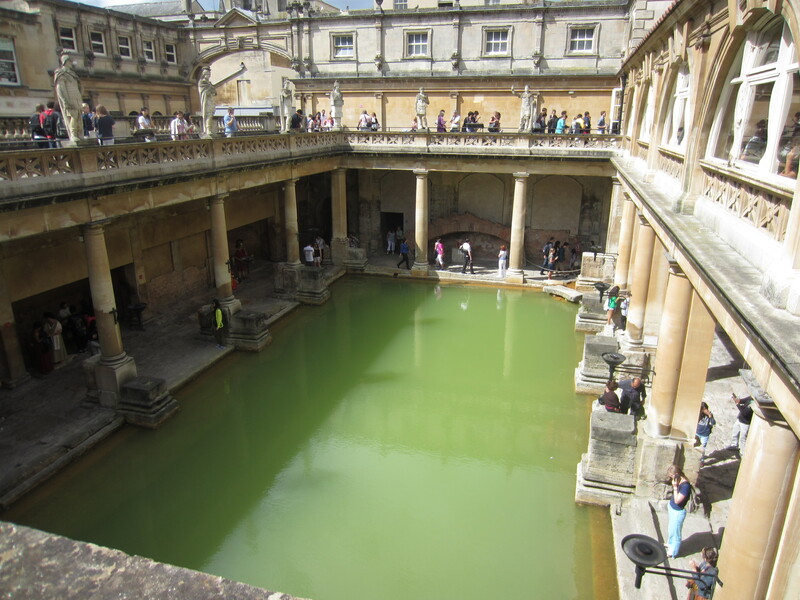 The baths weren’t looking overly salutary- they were green, frothy and uninviting. Actors dressed in costume re-enacted characters from Roman times beside the water but I was looking more for a character from the Regency era. Continuing on my quest, I walked towards the gothic Bath Abbey. Passing through the bustling Abbey churchyard, I could see how this lively city provided ample writing material for Austen. The streets were filled with buskers, overflowing cafes and relaxed tourists but no aloof romantic protagonists that I could see. At the Abbey, I clambered up the 212 steps to see Bath from a height. It was a great way to take in the views and get a sense of the rural beauty of Bath. From here, I was also able to clock in a few places I had yet to explore on my search. 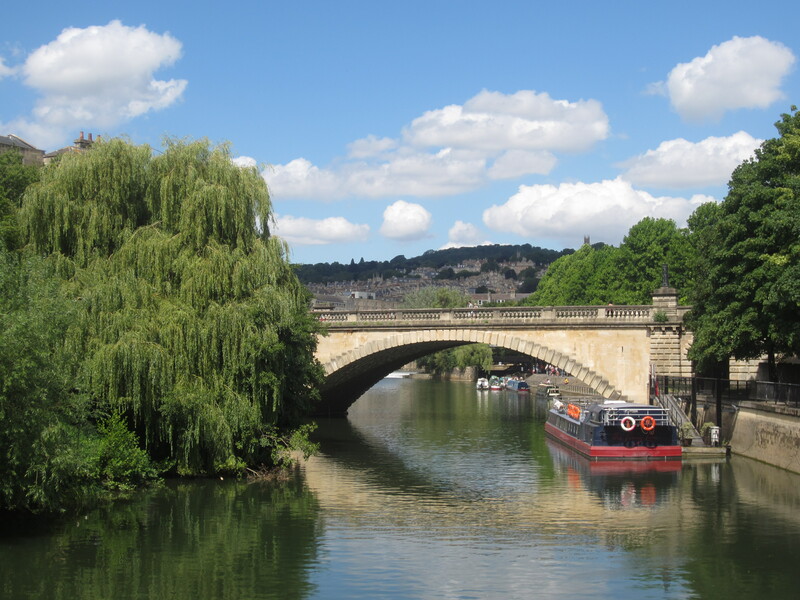 One such location was Pulteney Bridge which crosses the River Avon. It seemed the perfect setting for a romantic encounter with the gushing water and the boats gliding by but after 15 minutes, it was clear I was yet again looking in the wrong place. There was no one there that resembled Laurence Olivier, Colin Firth or Matthew Macfadyen. There were two last locations on my list. The first was Sally Lunn’s House. My spirits were restored with the famed French baker’s bun. Afternoon tea featured strongly in all the Austen films that I had seen so I sat looking as ladylike as possible with my tea and bun but to no avail. My final stop was the Jane Austen Centre which gave a comprehensive overview of what life was like during the Regency times and Jane’s background. Unfortunately, Darcy types didn’t appear to be interested in the centre- that afternoon, the visitors were predominantly women or else men who appeared to have been dragged there by their partners. I bought an ‘I love Darcy’ key ring and left. Exhausted from a day of Darcy hunting, I sat myself down at a quiet bar. 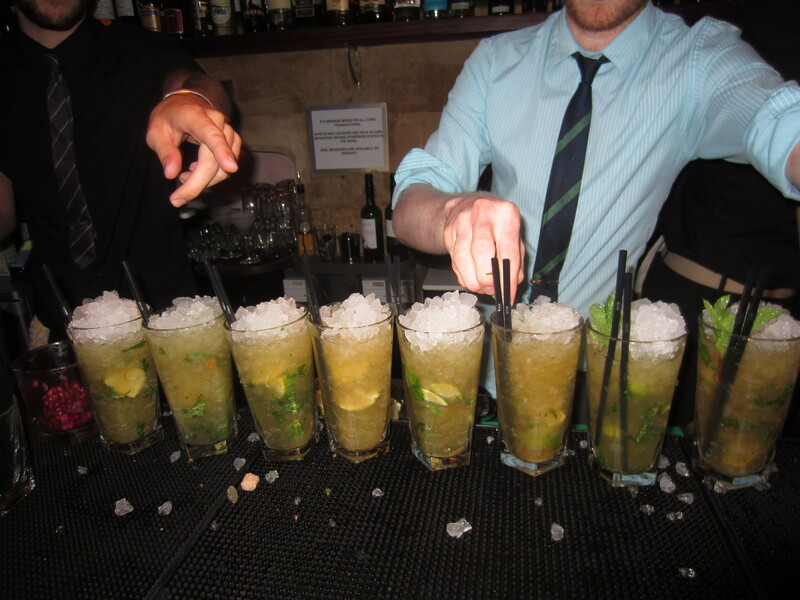 The only thing that could resuscitate the day was some cocktails, specifically mojitos. I ordered the drinks and shortly heard that reassuring sound of ice being crushed and drinks being shaken. I looked over to the barman and suddenly started paying attention. Tall- tick. Dark- tick. Handsome- tick. Brooding- tick tick. I began to wonder if I had got it wrong all day. The modern day Darcy possibly didn’t wander around the Royal Crescent or Pulteney Bridge waiting for his Elizabeth and the modern day Elizabeth didn’t need her Darcy to negotiate her sister’s unsuitable marriage- what she needed was a man who can make a good cocktail. Despite having finally found my Darcy, I think it’s time I read Pride and Prejudice, especially now that this is the 200th anniversary of the first publication. I might also dip into Sense and Sensibility in case I go looking for an Edward Ferrars next time.